DJEMBE! The Show makes its US Premier at the Apollo Theater. Book by West Hyler and Doug Manuel, the show is broken down into sections of performance and interactive. You are introduced the heartbeat that connects us all. 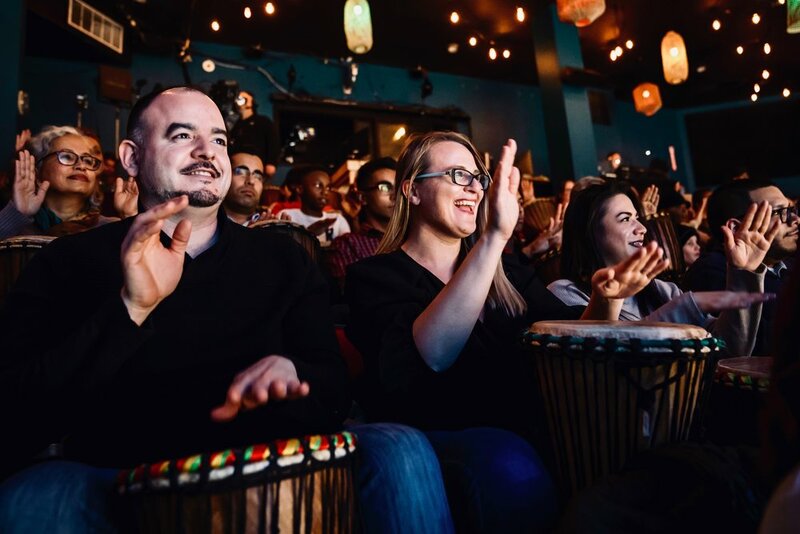 A drum on ever seat invites you to immerse yourself into a ‘joyous musical journey’! DJEMBE! (JEM-bay) engages audiences in a high-energy program of powerful storytelling and inspiring music, including iconic pop hits. Leading this lively musical journey will be the trio of Broadway talent Ben Hope (Once) as Emcee; critically-acclaimed Chicago musical theater artist Rashada Dawan (Caroline, or Change) on lead vocals; and Guinean master drummer and folklorist Fodé Lavia Camara, backed by an ensemble of world-class musicians. The Djembe drum originates from Africa and in a transient journey over time and seas, the djembe has influenced our worldly cultures by continuously creating some of the most diverse and eclectic music from samba to swing. The Apollo Theater is the perfect venue for this rapturous evening. Within the space, just by sitting down you are already involved in the performance. A drum on every seat makes it a little cramped, but you are all in this together and the barriers of traditional audience formality is out the window. The curves of the theater make the intimate space visually pleasing and involved. Todd Rosenthal’s scenic design with muted colorful woven wicker lights hanging around the theater and the sails stretched to be the screens for the projections all added to this mentality of a ship. Resean Davonte Johnson’s projection design was beautiful. With abstract movement projected during the beginning sequences the vague colors transition into a historical stock imagery collage sequence. As if you took a thought out of the sky to examine it and upon further study start to find the lines and small details that it reveals. The timeline throughout history of this abstract concept of a beat, of music. Between the scenic design and projections is a combination in nautical elements and tropical coloring mixed together through the sands of time. Zach Blane’s lighting furthers this idea through soft blues and greens for gels and then hikes up the contrast and intensity of the lights during certain sequences. The structure for distinguishing between performance and learning sequences was very well done. It’s a great example for any early lighting designers to see how a multitude of sequences flow together and how that works with narrative. Chicago southsider Rashada Dawan showcases her immense talent as the only female vocalist in the show. Her singing has a clarity and soul that deeply connects with you. Dawan’s upbeat attitude is contagious and her narrative monologues were told so well with storytelling techniques and emphasis. Dawan also toured for four years with Disney's The Lion King Las Vegas company and in the Gazelle National Tour as Shenzi (affectionately known as "the Whoppi Goldberg hyena") and is the founder of B.FLI Productions, a nonprofit organization aimed to help end violence and increase mental wellness through the arts (www.bfliproductions.org). Wonderful performance!! The multiple costume designs for Dawan by Obie Award™-winner Montana Levi Blanco helped as well push the evening forward through each outfit change. From traditional African garb to modern chic power outfits, Levi Blanco honors the past, while maintaining a colorful color palette that really embodies the high energy in the room. What kept the show so fresh was the balance between interactive segments and narrative or performance. These breaks not only gave your hands a rest, but allowed you to sink deeper into the reflection and positive messages the performance evokes. There is an element of self-love within this work that is just a joyful reminder to have fun let loose, and remember to send good energy to yourself and send good energy to others. The power of thought and how positive thinking can greatly affect you and your perception of the world. Ben Hope is your emcee for the evening and playfully guides you through your journey to learning the djembe. Hope one may most recognize him from his multiple theater roles and his debut on Broadway in 2012 with the lead role in the Tony-Award winning musical Once. Hope and Dawan’s voices blend and balance each other so flawlessly together. Both possess such a vibe about them that you just want them to never stop singing. Additionally, they sung in various foreign languages – truly impressive as native English speakers. I am always highly impressed when singers are able to learn foreign songs, but also do them justice in tone, dialect and inflection – both Hope and Dawan knocked it out of the park! The lead djembe drummer is Fodé Lavia Camara, who is a master drummer, folklorist, percussionist and choreographer. Camara has a high energy and command about his presence that is friendly and welcoming. He provides a strong foundation for the emcee and vocalist to liven the audience further. I was happy to read in his bio that as a West African native, he has traveled the world as an instructor, choreographer and guest artist sharing his knowledge to strengthen the new generation in preservation of West African traditions and the influences of these traditions on the global community. The three are supported by a stunningly talented group of musicians: Patrick Donley (musical director/ keyboard), Evan Salvacion Levine (bass), Jeff Swanson (guitar), Abou Sylla (balafon/ djembe player), Clif Wallace (percussion). This show captures the heart and soul through the natural musical beat living inside of us. It’s even highlighted in the folk song “Moses Don’t Get Lost”. What happens when the drum itself is removed? The beat is still there. It’s a rhythm that will truly get you and you will not leave the theater without it. Date night, family night, girls’ night out – this is a show for EVERYONE! It’s a feel good exploration of a magical instrument and the profound impact it has had on humanity. You do not want to miss this experience. DJEMBE! The Show will be performed at the Apollo Theater, 2540 N. Lincoln Avenue, Chicago, in a strictly limited engagement, March 19 - June 2, 2019: Tuesdays - Fridays at 7:30 p.m. and Saturdays at 8:00 p.m., with matinees on Wednesdays, Saturdays and Sundays at 2:00 p.m.